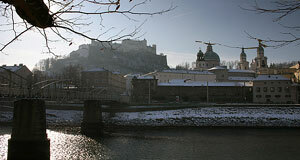 The Mozartsteg is an Art Nouveau bridge for pedestrians in the city centre of Salzburg. It is locally well-known for its neat design and gained international "fame" by featuring in the Hollywood movie "The Sound of Music". The Mozartsteg was built until 1903. The project was initiated by a private association, the "Mozartstegverein". This association owned the bridge, which linked (and still links) the area of the Steingasse/Imbergstraße and the Rudolfskai/Mozartplatz Square. According to local anecdote, a wealthy owner of a café on the Imbergstraße side lobbied for the construction of the Mozartsteg and donated money for it – because his café did not receive the amount of guests that his competitors on the other side of the Salzach River had. The café owner′s name was Georg Krimml, his company the Café Corso. The lobbying was successful, the bridge was opened in spring 1903. The opening ceremony was chaired by Clemens Graf Saint-Julien-Wallsee, governor of the (then) Duchy of Salzburg and the city′s mayor Franz Berger. Until 1920, the Mozartsteg was property of the society mentioned above, which charged a toll for using it. For this purpose, a little toll house was built right next to the bridge on the Rudolfskai side. The house is still there and now home to a local jewellery and craft artist. As a toll station, it became redundant after the city of Salzburg purchased the Mozartsteg and opened it to pedestrians and cyclists in 1921. Today, the Mozartsteg is not only a picturesque bridge, but also a battle ground for pedestrians and cyclists ignoring their obligation to dismount. You will find pictures of the Mozartsteg in our photo collections.